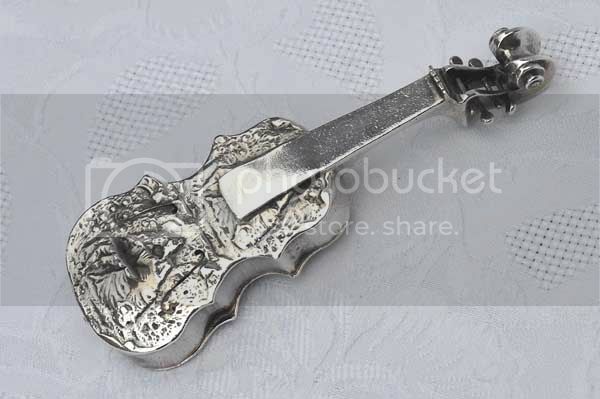 I have this model of a violin, hollow, but with cast silver top and bottom. 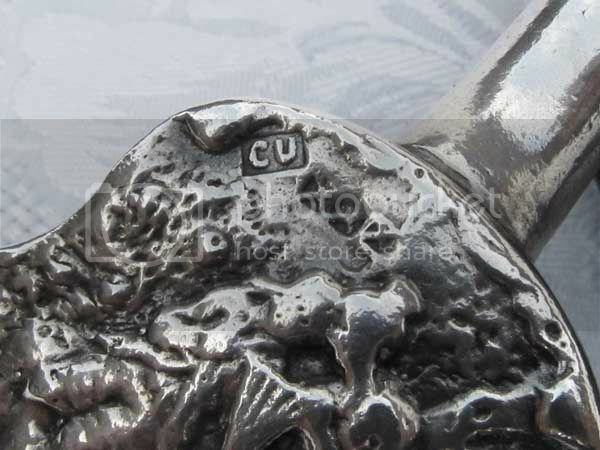 Purportedly, it has a maker's mark 'CU' and partial Amsterdam city mark, but I'm not sure, so I'm checking with the forum. Initially, I thought they were pseudo marks and part of the casting, but the back and front of the violin are each made of two joined panels of the same scene (four panels in all, though one with an applied bridge and one with an applied neck), and only one has marks. So perhaps they are real, after all. I would be interested in the forum's opinion. Whether or not they are real, who's mark this is and what is the approximate date of the piece? If only a pseudo mark, obviously this wouldn't be the real maker, in which case is it a Dutch or Hanau piece? In my opinion we are looking at a modern brand of pseudo/fantasy or decorative marks neither Dutch nor Hanau perhaps made in Israel. Thanks for your thoughts on this. It may have been made outside of Holland or Hanau, I don't know. What I can say is that it is highly unlikely to be of recent manufacture. Having the item in hand, with a clearly historical ding and level of tarnish in the inaccessible places, it seems to me to have been made around 1900 and no later than the first half of the 20th century. Wishing you a successful collecting New Year! Thanks very much for your continued interest in this item. I no longer have the piece, so the pictures are all we have to go by. I tend to agree that they do look like part of the casting, which means that the makers would have had three panels without the marks and one with.